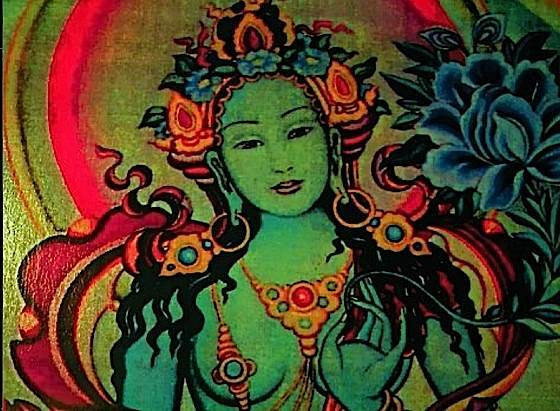 Dakini day, celebrated on the 25th day of each lunar month in Vajrayana Buddhist traditions, celebrates the feminine energy of wisdom. Devoted Buddhists will celebrate with a Tsok (Tsog), a feast including food, singing, a group (or single) sadhana full of sound and celebration. The 10th is also celebrated with Daka Tsog to honor Guru Rinpoche and the Heroes (Dakas). Tsog is normally a commitment in higher yogic practices. NOTE: A reader pointed out a discrepancy between Lunar 10th by the official calendar and the dates posted on temple sites. Please be guided by your own tradition on this as there may be an astrological reason for the variance. Our calendar is mapped to the official lunar calendars. 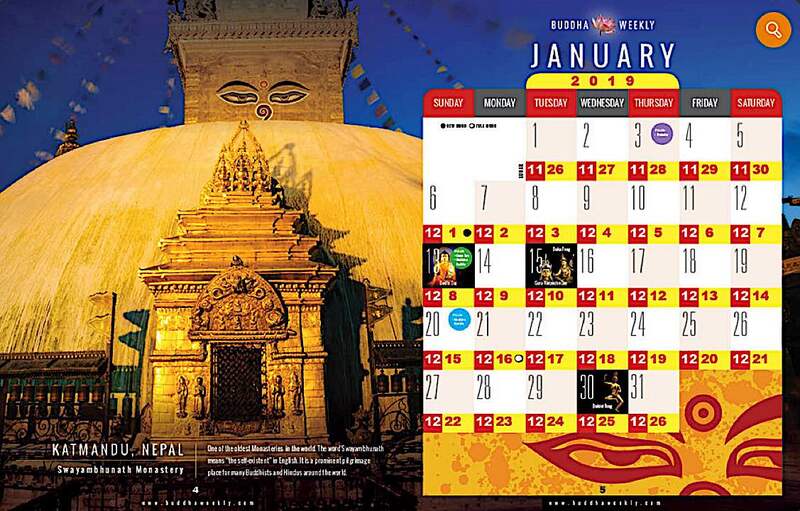 Please especially check January 15 vs 16 and March 30 vs 31 as these seem to disagree in some calendars, including the 2019 Drukpa Calendar. 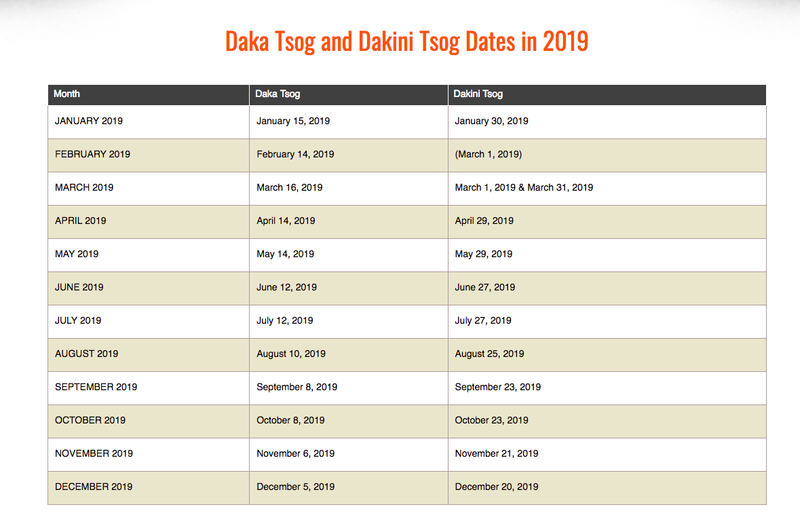 Tsog Offering Dates (based on lunar calendar 10th and 25th) shown in Western calendar dates. 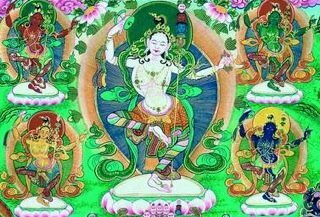 Without contradiction to their role as exemplars of Emptiness, Dakinis can also represent fierce activities, such as protection (Green Tara and Palden Lhamo) — the ferocious protective love of a mother [For a story on Palden Lhamo, the female protector, view here>>]. Most Tibetan Buddhist temples and meditation centres try to arrange a monthly Tsog on this day each month, with celebrants bringing food as offerings. 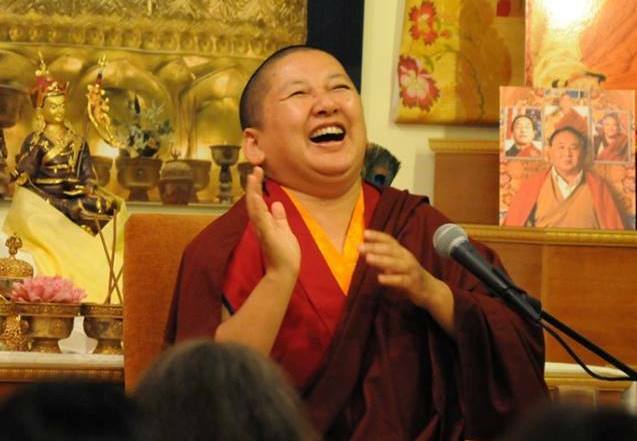 It is always a happy day, that invites blessings not only for the attendees, but for all sentient beings. The Dakini represents the divine feminine. (Khandroma in Tibetan, K’ung-hsing fo-mu in Chinese.) Dakini practices focus on Enlightened Feminine (although there are also some “unenlightened Dakinis”) — the Enlightened Dakinis such as Vajrayogini or Vajravarahi. Dakini can also refer to female sangha, teachers and students who might be exemplars of the path. In Buddhism, typically, the male Buddhas represent compassionate means, epitomized in Avaolokiteshvara (Chenrezig), while the female Buddhas represent Wisdom, typically exemplified in Tara or Vajrayogini. The symbols of bell and vajra (Ghanta and Dorje) represent female wisdom — the bell, which makes the sound of “Emptiness” — and the Vajra, representing compassionate means. 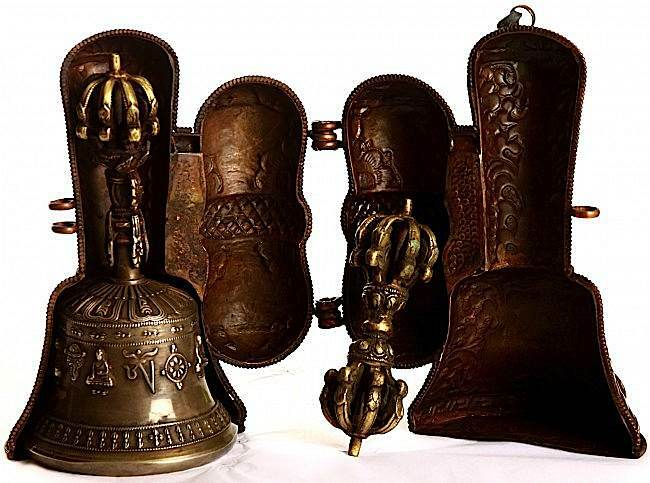 The bell, on the left, represents Enlightened Feminine Wisdom while the Vajra (right) represents “Male” Compassionate Means. Just as true wisdom is “elusive”, the female enlightened, in the form of Dakinis, is very “elusive and playful.”  Dakinis recognize that true wisdom does not come from intellectual debate and meditative contemplation alone. The elusive wisdom of Dakinis is the ultimate wisdom of Emptiness. There are also male aspects, called Dakas. Typically, the 25th day of the lunar month is focused on Dakinis, while the 10th day of the lunar month (which is also a Tsok feast day) is for the Dakas — and also to celebrate Guru Rinpoche Day. Vajrayogini (and Vajravarahi) is the “highest” manifestation of Dakini Wisdom. Here she is symbolically naked (freedom of wisdom), drinking nectar, with the male Heruka (compassion) khatanga on her shoulder. She dances to demonstrate the joy of realization and the activity of Dakinis. The skulls represent concepts such as impermanence. Red indicates magnetizing influence — and also the “speech” of the Buddha (Typically Body is white, Speech red, Mind blue). Vajrayogini, representing “wisdom of emptiness” can be practiced/portrayed/ visualized in union with compassion in the form of many Herukas, such as Chakrasamvara or the great Hayagriva (fierce manifestation of Chenrezig or Avalokiteshvara). Wisdom, without Compassion, is not the path to Enlightenment, which is why, in Tantric Buddhism, Dakinis are often in union with male Herukas (Buddhas) — this symbolically demonstrates the union of Wisdom (Dakini) and Compassion (Heruka or “Hero”). This is symbolic, not literal — in other words not a sexual representation. It’s symbolically conveys you cannot have one without the other (wisdom without compassion, or compassion without wisdom) if your goal is to achieve Enlightenment for the benefit of all sentient beings. Also, that the union of wisdom and compassion bring bliss. Tara, the most beloved of Female Buddhist Enlightened deities, represents wisdom in action. Dakinis are also strongly associated with the great Mahasiddhas of India, particularly Vajrayogini. It is often said that all of the Mahasiddas relied on Dakinis. Also, most of the great Enlightened Yogis and Yoginis of India and Tibet practiced Dakinis. 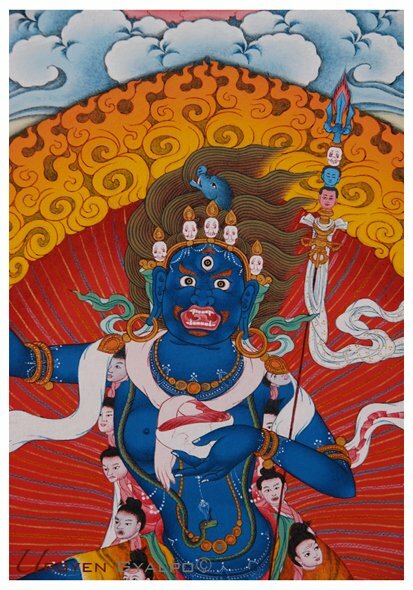 Dakinis and wrathful deities are important higher tantra practices in Vajrayana, and are the most likely to be misunderstood due to the symbolism. There are, it is said, countless emanations of wisdom, although at the ultimate level, they are all one. 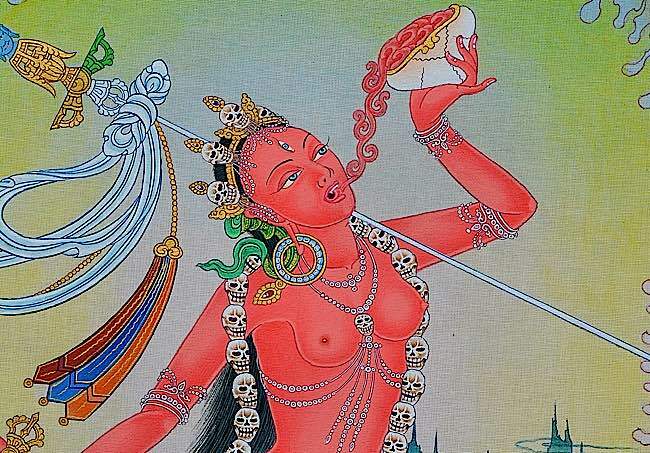 Probably the best known Dakini is Vajrayogini. These practices do require a teacher and initiation, due to their profundity, but many Buddhists around the world attend Tsog (as spectators and to receive blessings) and Dakini public pujas as a blessing. Padmasambhava described the Dakini as the “bestower of excellent blessings.” . Keep up your daily meditations and practice, and dedicate a little time to the contemplation of emptiness. It is said that you do not have to call to Dakinis. Because we all have Buddha Nature, we all have Dakini within. Dakinis manifest spontaneously in our lives when we perform pleasing acts of compassion, conduct ourselves ethically, and follow the precepts. If you have no luck with the form, I can add you manually, but you’ll still receive a “verifying email” that you’ll have to click on to indicate you really want to be subscribed. (It’s the CSPAN rules:-) If you have no luck, please send me your email to editor@buddhaweekly.com. Thank you for this excellent magazine – one of the best Buddhist in the West 🙂 Namaste!